Scotland and Northern Ireland have been protected from hundreds of millions of pounds in spending cuts at the expense of England and Wales according to a report from the IFS. It highlighted a 'flaw' in how the Barnett formula deals with business rates. Spending in Scotland, Wales and Northern Ireland is mostly funded by block grant payments from Westminster. Increases—and cuts—to these payments are worked out by the Barnett formula to reflect how many people live in each place, as well as which administration is responsible for what. The formula is designed to ensure that spending per head will go up or down equally in all four nations. 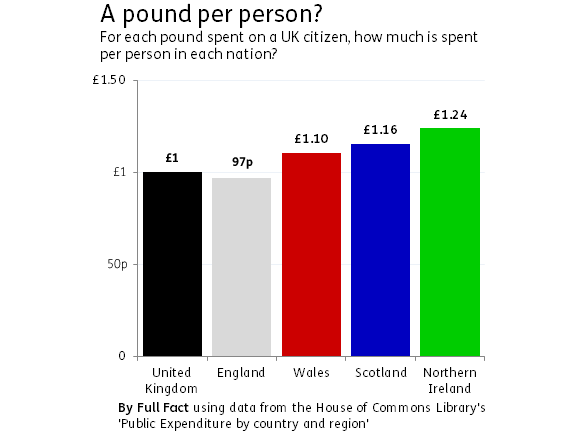 That's why Scotland, which started with higher spending, still spends around 20% more per person than England, at £10,152 per person last year compared to £8,529 for England. This is well known. But the IFS have found another disparity as a result of the way that the formula decides which parts of UK government spending are on devolved functions. In areas like education, which is completely devolved, a £1 rise in spending in England leads to a 10p rise in the Scottish block grant, because England has roughly ten times the population of Scotland. Things get a bit more tricky for departments that aren't completely devolved, like the Home Office. About 24% of Home Office spending is on the UK as a whole and 76% on functions in England that are devolved in Scotland. So for a £1 increase in the Home Office budget, Scotland sees a block grant increase of 7.6p. The problem here is that when Westminster departments have their budgets cut (or increased) the impact is not always spread proportionally across devolved and non-devolved functions. But the Barnett formula's block payments are calculated before we know where these cuts are going to fall. This knocks the per-person spending across the four nations out of sync. Normally, these changes would even out over time and across departments. However, the IFS show that this doesn't work out when it comes to local government spending. Cuts in local government spending since 2010 have totaled £110 per person in England and Wales, but the Scottish and Northern Irish block grants only fell by £19 per person—17% of these cuts. A £1 cut in the Department for Communities and Local Government's budget in England only leads to a 17p cut in spending per person in Scotland and Northern Ireland. The other 83p is treated as coming from business rates, which are (broadly) kept in the nation they were raised from. So taking £1 from the local government budget (treated as partially devolved) and moving it to education (wholly devolved), will result in a cut in the Scottish block grant of 1.7p. But the increase in Education spending increases the Scottish block grant by 10p. Moving spending from one area to another increases spending per person in Scotland when spending per person in England has not changed. The IFS says this is "not in the spirit of the Barnett formula" and argues that if the business rates had been categorized in a fairer way, Scotland and Northern Ireland would have faced £600m and £200m more in cuts than has been the case. Chancellor warns of £12 billion in welfare cuts: where could they fall? Have alcohol-related hospital admissions quadrupled in Scotland?